Amazon has came up with it’s all new Amazon Blackberry Quiz Contest where you can participate and win a Blackberry Key2 smartphone for free. 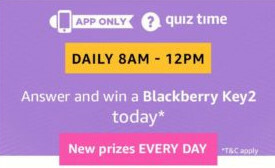 You just need to give all the Amazon Blackberry quiz answers correctly to be eligible for the lucky draw. Then via lucky draw, winners will be chosen and Blackberry Key2 phone will be given as prize. SEE ALSO: Amazon 7th August Quiz Answers. Q. Which of these athletes won the men’s single at the 2018 Italian Open Tennis tournament? Q. Who was ranked No. 1 on the Forbes ‘World’s Most Powerful People 2018’ list? Q. In _, India won its first cricket world cup. Fill in the blanks. Q. In 305 BC, which Maurya ruler defeated Alaxander’s general Seleucus Nicator? Q. The Indian state of Nagaland was formed in 1963. Which state was it a part of earlier? The contest is valid only on 5th August 2018. Available only on Amazon mobile app. Give correct answers to be eligible for the lucky draw. Only one participant will be selected as winner. The winner will get Blackberry Key2 mobile as prize.